“We seek the bravest!”—with these words, the temple of Rondra in Firunen summons entrants from all corners of the land to test their mettle in a holy tournament and determine whom among them is, indeed, the bravest. At stake is an exclusive, hereditary license to sell steel in the city of Firunen. The party arrives just in time for the contest and meets an old friend—Alriksej Jantareff, a Norbard merchant. He takes huge risks to enter the tournament and needs the party’s assistance to win. What starts out as a small, annual celebration honoring the long-extinct Order of the Theater Knights soon turns deadly…. 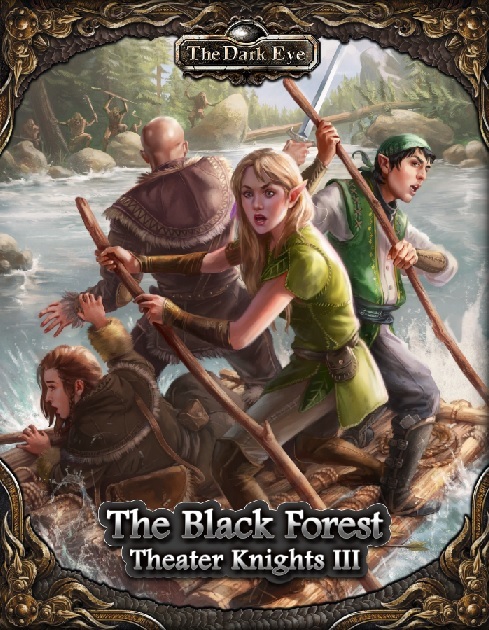 The epic saga of the Theater Knights returns in the third book of the campaign, The Black Forest! Then, continue your adventures by backing the Aventuria Magic Kickstarter, launching in late October! Included in that Kickstarter will be Theater Knights IV: The Green Platoon. Look for more information about the Kickstarter soon! Very exciting, gang! Can’t wait to back the Aventuria Magic Kickstarter! Beats me how I could have ordered a pinted copy. I don’t see it in the shop, when and where was it put up for sale. We put our 1yr campaign on hold as I was worried at the lack of TK material, maybe able to start it up again. I buy through a book shop that uses Ingram and there has been nothing new since part 2 ages ago and nothing in the future either. It’s going up this week, as the article says. You should see it in the next day or two.